Finding the right pricing engine to become a supported investor on can be difficult. You need to make sure that the company you trust isn’t just putting your products in front of anybody and everybody, but in front of the right borrowers and in the right location. Not only that, but you need the rates that pricing engine is quoting to be accurate and updated at all times, so that borrowers are getting all of the right information, and preventing looking like you’re offering old or inaccurate rates. Our user base stretches across the country, with each region of the U.S. accounting for at least 6% of our rate quote volume so far through 2018. No matter where your customers are using your products, Mortech has users there. Only want your products available in one region? With Mortech, you don’t have to worry about not having coverage. Mortech can create and upload a wide variety of custom rate sheets to offer in our mortgage engine. We’ll also automatically update those rate sheets whenever intraday rate changes occur. Your rates won’t just be accurate at all times, but you won’t have to worry about being the one constantly going in and updating them. Need to see for yourself? No problem! Mortech gives you a test account within which you can run scenarios to view how your rates are being shown, and make sure that everything is displayed exactly how you want it to. You may not want to just make sure your rates are accurate, but control who sees them as well. We’ve got you covered there, too. We provide full month-by month customization, allowing you to enable which lenders can view and use your products. 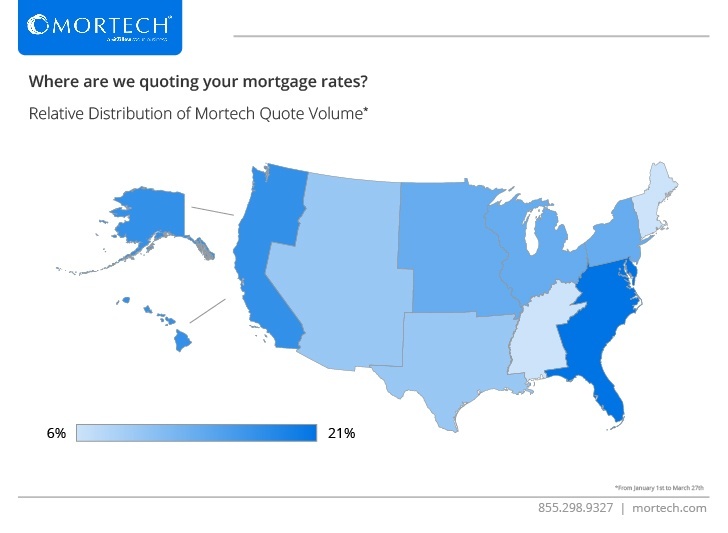 With Mortech, you’re not just quoting your mortgage rates. You’re posting your rates directly where you want them to be, without having to worry about inaccuracies. This peace of mind allows you to focus on other, more important day-to-day tasks, leaving the backend work of powering your rates to our years of mortgage experience behind our best-in-class pricing engine. Contact us today to learn more about what becoming a supported investor with Mortech means for you.